Fun fact: in 1906, residents of Louisville’s Shelby Park neighborhood each chipped in $2 to purchase land for a neighborhood library. That building still stands today – residents know it as their Shelby Park Community Center. It was a perfect execution of crowd-resourcing, way ahead of its time, and Mark Noll, project coordinator at Louisville Metro Government, thinks it’s time to try it again. “We won’t be able to purchase any land with $2 donations today,” admits Noll, “but we could get a pretty cool bus stop!” And that happens to be just what the neighborhood needs right now. Today’s Louisville, Kentucky, is not known for it’s public transportation system. In fact, most Louisville bus stops are nothing more than a pole and a dinky sign. Not exactly inviting – especially with temperatures up in the 90s during summer – and ridership numbers reflect the fact that the system is run down. But change may be on the horizon: by the time Thanksgiving rolls around, Louisville residents will have two brand spanking new bus shelters to be very thankful for. Noll and his teammates are the right guys for the job; two of them work in the Mayor’s office, on the innovation deliveries team, and the third is in the Louisville office of sustainability. Naturally, then, the designs for two new shelters they’re envisioning will be both cutting-edge and green, and inspiration is coming from an unlikely place: the city’s rubbish bin. At least half of the raw materials for the new shelters will be sourced from a bike parts graveyard of sorts, over at Bicycling for Louisville, and from the warehouse scrap pile over at First Build, a community of makers who design and prototype everything from benches to tables to robots. “We’re trying to use salvaged materials wherever possible,” says Noll. That cuts costs as well as the city’s carbon footprint. 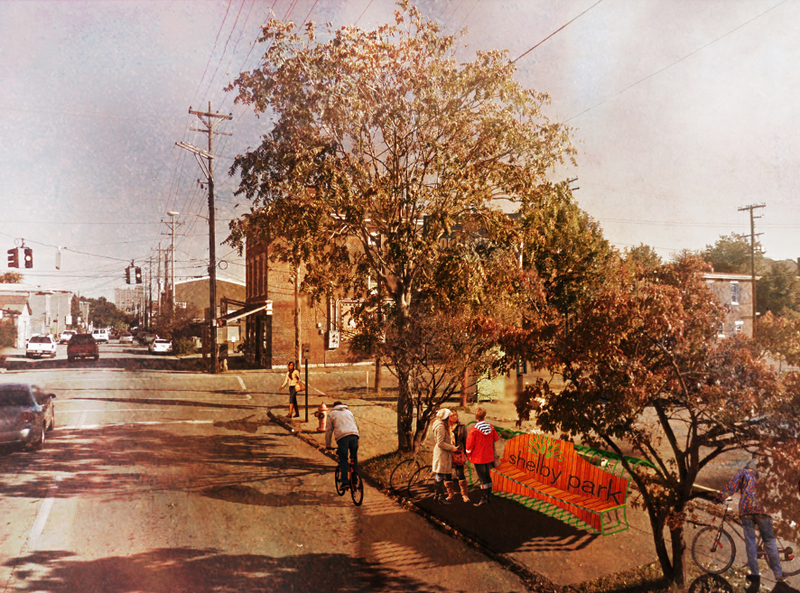 On board with Noll and his team are local non-profit and advocacy group Bicycling for Louisville, Shelby Park Neighborhood Association, and sustainability-focused architecture firm Luckett and Farley. The three are in talks now to decide on their designs, so it’s going to be a quick and energetic turnover, and it sounds as though Louisville residents have a real treat in store. Here’s what the team has decided already: “We want to turn them into places, destinations, gateways for the neighborhoods and gathering places,” says Noll, “almost urban living rooms, so it’s not just a bus stop. It’s a place where people socialize.” To that end, the team will install comfortable benches and big maps to help people situate themselves. Doesn’t being oriented make the trip feel shorter, after all? The team is planning to use LOTS of vibrant color throughout, to brighten up the drab concrete corners. They’ll also keep an eye out for the needs of bicyclists who have previously had no place to rest or park their bikes while they wait. On the team’s wishlist – for down the road – is a bike repair station. The hope, as the team culls through various design possibilities right now, is that each of the two shelters will in some way reflect the culture of the neighborhood they serve – Shelby Park and SOBRO residents, get out your neighborhood pride! “I think a lot of the time people may not be able to orient themselves and realize, ‘hey, there’s this really cool park three minutes’ walk down the street.’ So we want to draw attention to those neighborhood assets,” says Noll. Man, have we all been stuck in cars for a really long time, or something? Seems no one knows anymore how close and accessible our cities’ treasures really are to us. To celebrate the completion of the two new bus shelters, and to make sure everyone’s got them well on their brainmaps, Noll and his team are planning a party on wheels. After biking (festively!) from one new bus shelter to the other, residents will land at a local bar and drink to the urban revival taking place right in their own backyards. The ioby Trick Out My Trip opportunity is funded by Transit Center.